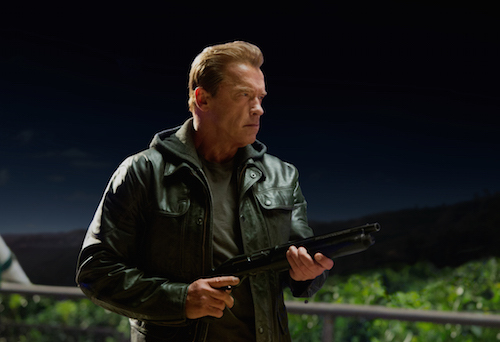 Synopsis: When John Connor (Jason Clarke), leader of the human resistance, sends Sgt. 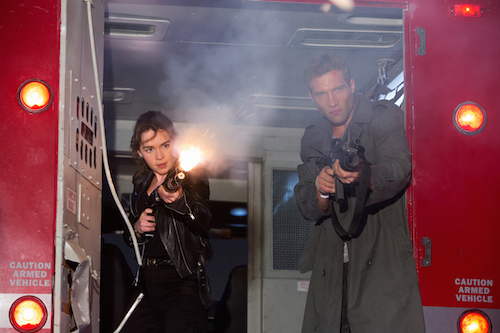 Kyle Reese (Jai Courtney) back to 1984 to protect Sarah Connor (Emilia Clarke) and safeguard the future, an unexpected turn of events creates a fractured timeline. Now, Sgt. Reese finds himself in a new and unfamiliar version of the past, where he is faced with unlikely allies, including the Guardian (Arnold Schwarzenegger), dangerous new enemies, and an unexpected new mission: To reset the future. For a film franchise predicated on time travel, the Terminator series has gotten by relatively unscathed as far as logical deconstructions go. Because the first two films had such a unique vibe, moviegoers were willing to overlook what is largely a very convoluted concept. Terminator Genisys, on the other hand, is flimsier than a Dorito in Seattle, and is therefore subject to rampant scrutiny. Here is a movie that, in trying to put a unique twist on the first movie’s set-up – that is, Kyle Reese is sent back to save a young Sarah Connor from being killed by a Terminator – ends up undermining every one of its best elements. From the dry humor to the unexpected twists and turns, nothing from the original Terminator is safe, and that, in itself, is Terminator Genisys‘ biggest crime. Because Terminator Genisys‘ plot is based purely on flipping the first film’s ideas on their head, it’s best not to delve too deep into the plot. All you need to know is that Kyle Reese and Sarah Connor are once again working to stop Skynet from becoming self-aware, and another Arnold Schwarzenegger-looking robot is there to help them along the way. The film plays around with the original’s idea of Kyle finding Sarah as this vulnerable waitress, and imagines an alternate timeline where a Terminator actually went back in time and saved Sarah when she was 9. As a result, the Sarah Connor that Kyle Reese meets in Terminator Genisys is supposed to be a capable fighter and a strong female – basically the T2: Judgment Day version of the character, but younger. It’s a fine way to subvert expectations, but the film doesn’t handle the reveal very well, choosing only to fill in the most essential plot details and leaving the rest a mystery. Where the first film was neat and tidy in terms of how it dealt with time travel, Terminator Genisys tosses too many balls in the air and struggles to keep them all going. The film doesn’t go so far as to spit in the face of the original, but it doesn’t treat it with the type of reverence that the sci-fi classic deserves either. Terminator Genisys is overwrought with callbacks to the first two films, to the point it actually becomes parody. When Schwarzenegger’s T-101 says, “I’ll be back” it should be a joyous moment for cinephiles, but it’s actually eye roll inducing. Even so, Schwarzenegger is still great as the Terminator, with a delivery that’s just as flat and lifeless as it was back in the ’80s. Unfortunately, the same can be said of Jai Courtney’s (Insurgent) performance as Kyle Reese, except he’s playing a human. Courtney is supposed to be one of our heroes but he lacks the necessary charisma to carry the action scenes. Emilia Clarke (“Game of Thrones,” Dom Hemingway) fairs better as Sarah Connor, but her character never feels as strong as she’s supposed to be. We’re meant to believe that this version of Sarah Connor is a determined fighter, but she seems helpless to control her emotions at every turn. If there is one good thing to be said about Terminator Genisys it’s that the film has little to no fat. Sure, it would have been nice to stop and take stock of the time travel shenanigans, but perhaps it was best not to drag things out much longer than necessary. Especially since we end up in a very similar situation by the end. Yes, in all its efforts to be different, and play with the formula, Terminator Genisys still relies on the core plotline of nearly every other film in the franchise. Terminator Genisys feels like the springboard for its own franchise, a whole cloth rejiggering of the series’ history in an effort to entice a new generation. In doing so, however, the film has alienated fans of the original Terminator movies by taking the best moments and turning them into parody. Fans of the films will love seeing Schwarzenegger return as the T-101, but everything else in Terminator Genisys is forgettable. For the most part, the action in Terminator Genisys is fine. It has that relentless pursuit type feel where an advanced Terminator model is consistently on Connor, Reese, and the T-101’s tail, and there are some mildly engaging set pieces to boot. However, the special effects work in the film is pretty poor, to the point it’s actually jarring. The way the film plays with physics, the weird sheen on two helicopters during a third act chase, and even the look of the chromed skeleton T-101 units are all handled with a complete lack of care. Very rarely does a blockbuster of this caliber have “bad” CGI, but somehow Terminator Genisys has some of the worst.